Yeah, it's just like Amazon Echo—but better in almost every way. OK, now this is clever. That was my reaction when I asked Google Home, “What’s the temperature inside?” and the spunky little assistant replied, “It’s currently 73 degrees, but the Nest is set to 65.” Google’s hyper-aware, voice-activated speaker dishes up a lot of surprising answers, and it’s smarter, better sounding, and better looking than Amazon Echo. At $129, Google Home also beats the Echo’s current price by $51. That’s significant, because the two digital assistants promise essentially the same features and benefits. Both stand sentry in a constant state of awareness, listening for voice prompts. Both stream music, Internet radio, and podcasts. Both answer search questions. And both let you control other smart home devices with voice commands. No, it’s not a high-tech humidifier. It’s Google Assistant in its table-top splendor. 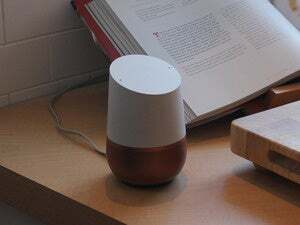 Google Home and Amazon Echo are the only real competitors in a race to put artificial intelligence on your nightstand, and Google beats Amazon in almost every category by which these gadgets can be judged. So, for me, the question isn’t, “Who makes the best tabletop assistant?” but rather, “Will Google stick with Home for the long haul?” Google, as history shows us, has a short attention span for hardware (see Nexus Q, Google Glass, Project Ara and others). 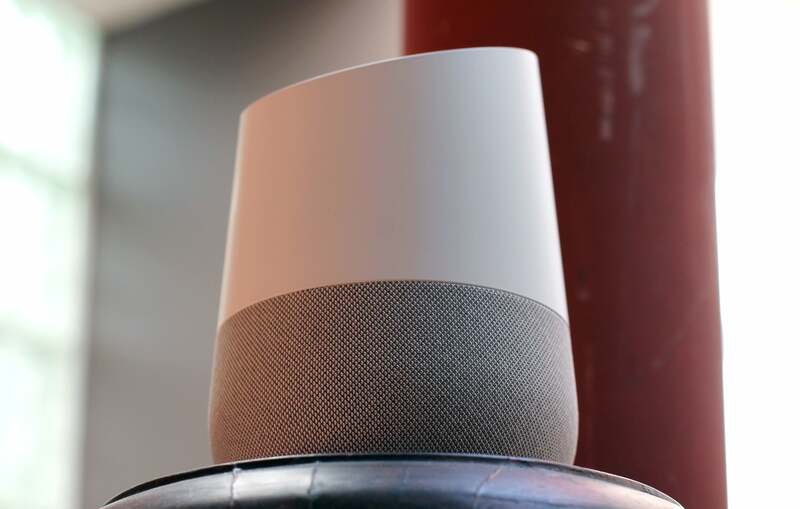 But Google Home is probably different, specifically because it’s easy to use, and eminently retail-friendly. So let’s dive in and see what it can do. And fair warning: I’ll be making frequent comparisons to Amazon Echo, because there’s no way to evaluate Google Home in isolation. The two A.I.-driven assistants are just that similar. Is it a high-end tissue dispenser? Or maybe the world’s most advanced personal humidifier? 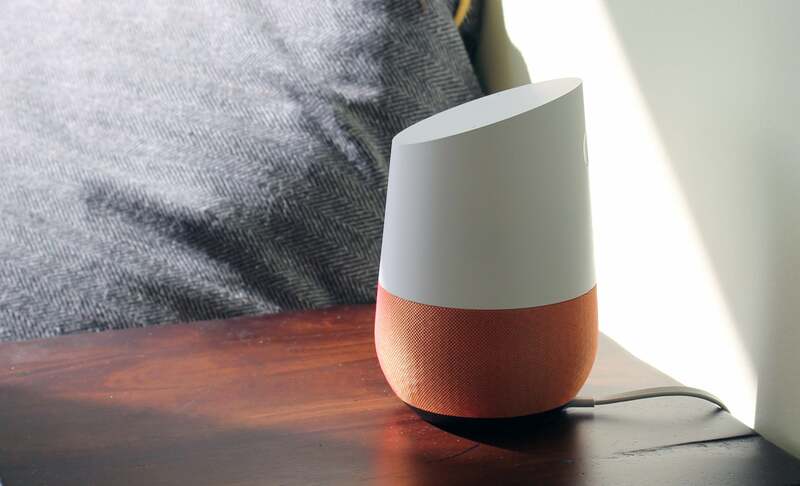 Google Home looks like some kind of indeterminate domestic something-or-other—not elegant enough to be an object d’art, but still tasteful, and clearly designed to integrate with home decor. How many tech gadgets are covered in fabric? Here we see fabric bases in slate (which comes standard) and mango. The chassis is deceptively small, just 5.6 inches tall, and 3.8 inches in diameter. Sitting on the desk in my home office, I twice caught Home in my peripheral vision and thought it was a carryout coffee cup. I blame the somewhat dingy white exterior. I also wish the cap’s delightful dancing lights—which respond whenever you voice an “OK Google" prompt—shined a bit brighter. But these are just small quibbles. It would be imprudent to say Google Home looks categorically better than the Amazon Echo, but come on. Which is trying harder? One evokes Sharper Image circa 2008, and the other looks like it was styled by Room & Board. Google also offers different base options, some in metal, some in fabric. How many gadgets have a fabric exterior? This is progress. We all have different aesthetics, but I have to give the style nod to Google Home. 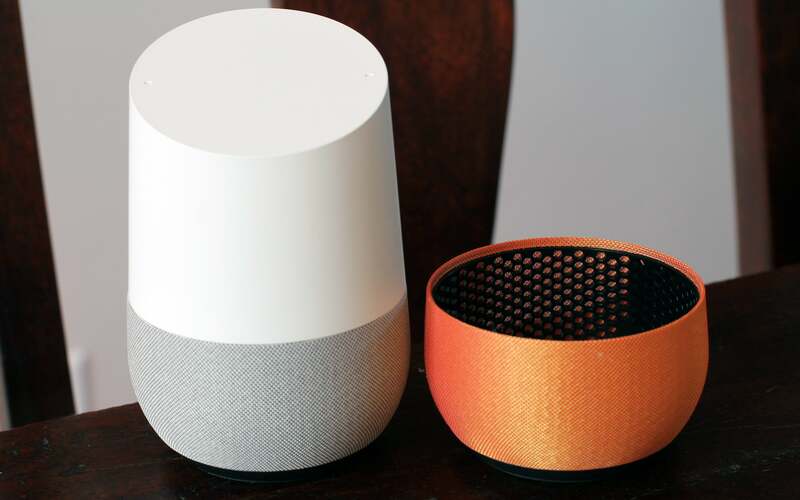 It’s impossible to avoid comparisons between Google Home and Amazon Echo. Their mission statements are almost identical. If you’re looking for a wireless system that can fill an entire home with spectacular sound, you should buy a battery of Sonos speakers. 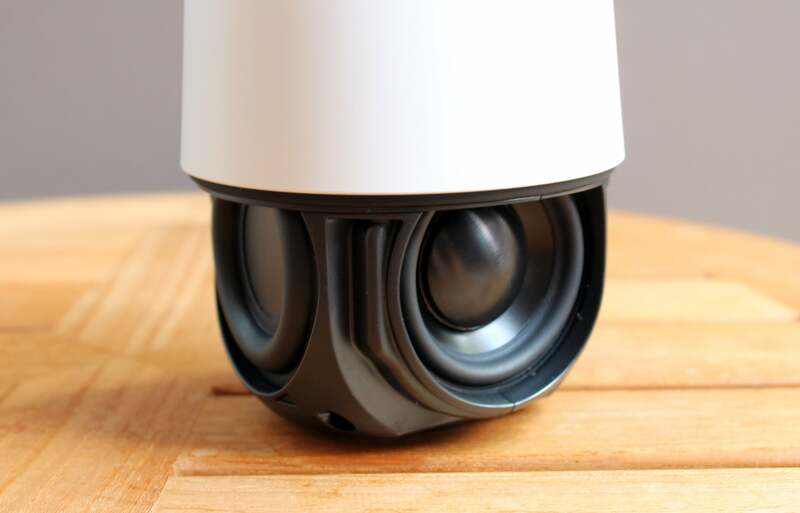 But if you just want to fill a single room with perfectly respectable sound, Google Home’s 2-inch driver and dual 2-inch radiators should suffice. 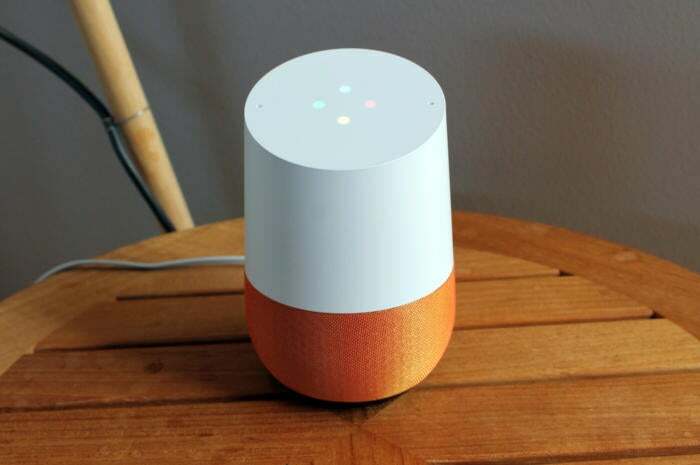 Or to put it another way: If you need a soundtrack for your dinner party, and want to change artists and songs on the fly with voice commands, Google Home is the perfect choice. It doesn’t get nearly as loud as Amazon Echo, but it does deliver richer audio. Its highs, mids, and lows simply sound more balanced, whereas the Echo sounds a bit thin and over-digitized. Home also sounds clean when its volume is set to 10, whereas the Echo distorts horribly at its highest volume levels. Google Home doesn’t get as loud as Amazon Echo—but it delivers richer sound, and it doesn’t distort at high volumes. For music playback, Google Home currently supports Google Play Music, YouTube Music, Spotify, and Pandora. TuneIn, meanwhile, handles live streaming radio and podcast content. Summoning specific artists, music tracks, radio stations and talk shows is a simple matter of voicing an “OK Google” command. Both Home and Echo feature far-field microphones that pick up voice commands under challenging conditions. Google goes with dual mics, but Amazon has an array of seven. Apparently sheer firepower can’t win this battle, because while Amazon’s mic performance is impressive, Google’s implementation is stunning. Witness: I put both hardware assistants in the sun room in the very back of my house. I then left the sun room, walked through an adjoining bedroom, and headed down a hallway to the living room. It’s a serpentine journey with a bunch of walls and open doors in between. Using my normal, non-shouty indoor voice, both Google Home and Amazon Echo could hear my voice commands from various points in the hallway—but Google Home’s microphone range was about 10 feet longer. It became vividly clear that the Echo couldn’t hear me unless I was closer to the nearest open door. Depending on your angle of approach, Google Home assumes different shapes. The next experiment was even more telling. With a Dyson vacuum cleaner going full-blast in the sun room, I prompted Google Home to play a music track. Its microphone heard my command, and started playing the track—this with the vacuum blaring just inches away. I next turned Google Home’s speaker to its maximum setting, and voiced a stop music command. The microphones picked up the prompt and stopped the music. I was duly impressed: Neither the vacuum cleaner nor Home’s speaker playing at full volume could overpower Google’s microphones. But Amazon Echo couldn’t deliver the same results in the exact same test scenario. It heard the same “play Katy Perry Teenage Dream” voice prompt over the din of the vacuum, but it couldn’t hear my stop command. So I turned the vacuum off, and tried stopping the music again. No dice—the Echo’s microphone couldn’t even cut through the noise of its own speaker. I finally had to get right above the Echo and scream at it to make the music stop. This is how the lights look during start-up. I wish they were even brighter. 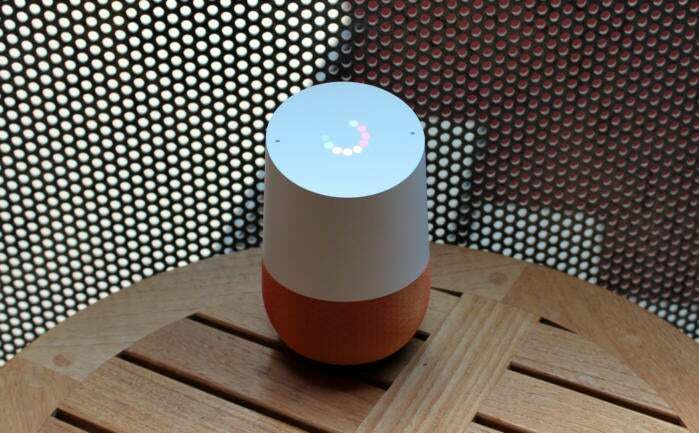 Google Home is basically a table-top manifestation of Google Assistant, the same AI engine that powers the new Pixel phones. Like on the smartphones, you can ask Google Assistant questions and tell it to do things, whether they concern the world at large, or your personal knowledge graph. I was frequently impressed by Google Home’s intelligence, but because Google Assistant sometimes seems so smart, it can be a letdown when it fails to deliver results. Nonetheless, Google Home usually beat Amazon Echo (which uses Microsoft Bing for search) in terms of basic worldly knowledge. Using the ever-repetitive “OK Google” prompt, I asked Google Home to tell me the box score for a just-finished Warriors game. It named Golden State’s opponent and the final score, but when I asked, “Who was the leading scorer?” it replied, “Sorry I don’t know how to help with that.” Still, Home’s reply was better than nothing, as the Echo couldn’t even give me a simple score report. Google Home looks even better in profile. How about translation? I asked Google Home, “How do you say, ‘Where is the nearest coffee shop?’ in German?” It replied with a direct translation. Then I asked, “How do you say it in Thai?” Google Home gave me the Thai translation, understanding that I was still asking for translations about coffee reconnaissance. As for the Echo, it replied, “Hmm, I don’t know” to the German query, and then pointed me to Bing search. As Google vividly demonstrated when it revealed Google Home in October, you can ask, “OK Google, tell me about my day,” and you’ll get a personalized audio report on your local weather, your commute to work, your next calendar commitment, and pending reminders. 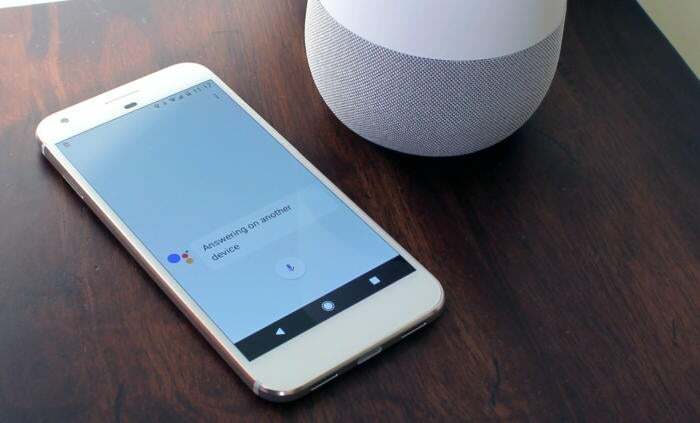 It’s nice to wake up and get all this information in a flash, but if you have your phone on your bed table, it will spring to life, jump into Google Assistant, and silently reply “Answering on another device.” This behavior happens every time you query “OK Google” with both Home and your phone in the same room. And it’s annoying. This is the Assistant message that appears on your phone every time you issue a command to Google Home. Google is still working out the kinks, but I’m willing to suffer a few inconveniences for what Google Assistant (and thus Google Home) can deliver. Voice “OK Google, add beer to my shopping list,” and a list in Google Keep instantly updates. Ask “What’s my commute look like?” and you’ll get a basic traffic report, suggestions for an alternate route, and estimated travel time by car. Amazon’s Echo can also help with shopping lists, calendars, and navigation, but you have to deliberately link other accounts for this functionality, and it can be a hassle. 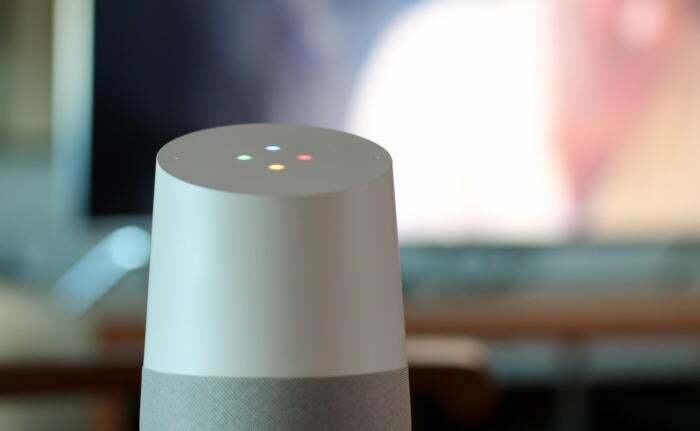 Google Home, meanwhile, simply dips into your existing Google account. It’s easy and seamless—and that’s a big plus for all the tech newbies who might receive Google Home as a Christmas gift. I was surprised that Home couldn’t recite the latest presidential polling results, while the Echo pulled that data from RealClearPolitics. But never forget: Artificial intelligence is in a constant state of becoming. Both Google Assistant and Amazon’s Bing-powered system will only get smarter, and Google has a big advantage here. It develops and controls the very A.I. platform on which its hardware depends, and its software services are already built into every Android phone. So if you don’t think Google Home’s core intelligence will quickly outpace the Echo’s, you just don’t understand how technology works. 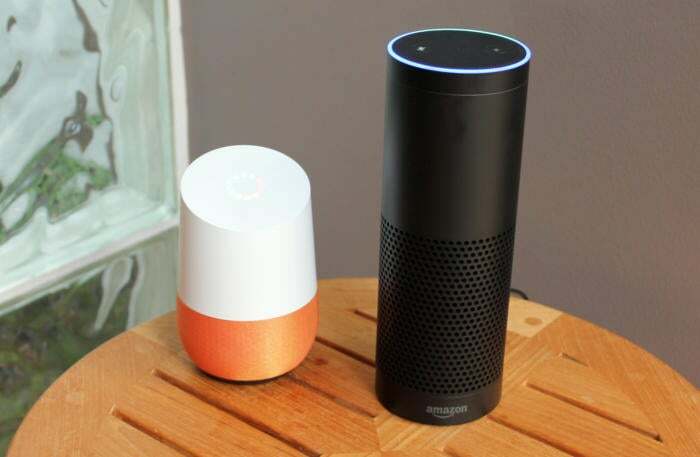 Voice-activated hardware assistants like Google Home and Amazon Echo are perfect for controlling smart home devices. With Home on my night table, I can ask for the temperature inside my house, and then prompt my connected Nest thermostat to turn up the heat to 70 degrees—all from the comfort of my bed, and all via voice prompts. It’s a wonderful luxury, and when Google Home does home control, it does it well. It just doesn’t support as many smart home devices and platforms as Amazon Echo. Nor does Google Home have sibling devices that extend Google Assistant to various locations throughout the house. Google Home can switch your TV from the cable box to Chromecast, and begin playing YouTube—all with a single voice prompt. Currently, Google Home supports the Nest thermostat, Google Chromecast, Philips Hue smart bulbs, Samsung’s SmartThings platform, and IFTTT recipies. 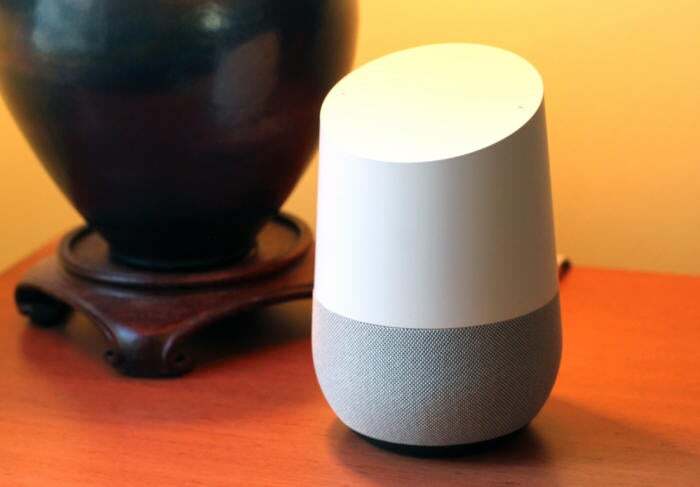 Google is working on a software development platform that will allow other hardware manufacturers to connect with Google Home, but that won’t be ready until next year. That’s a shame because if Amazon shows us anything, it’s that devices like Echo beckon a Jetsonesque future. Consider the set-up of Michael Brown, TechHive’s executive editor. He has an Echo in one room, and five Echo Dots (essentially baby Echos) strewn throughout his house. Because the Echos support Vivint’s smart home platform, Michael can use the six Echo devices to control 31 different Leviton light switches; various Kwikset smart locks; his smart garage door; his Nest thermostat; and his home security system. His Echos are also linked to a Harmony Elite universal remote for controlling an entertainment system. And remember: All of this is driven by voice control. It’s a wonder that Michael ever gets off his couch at all. 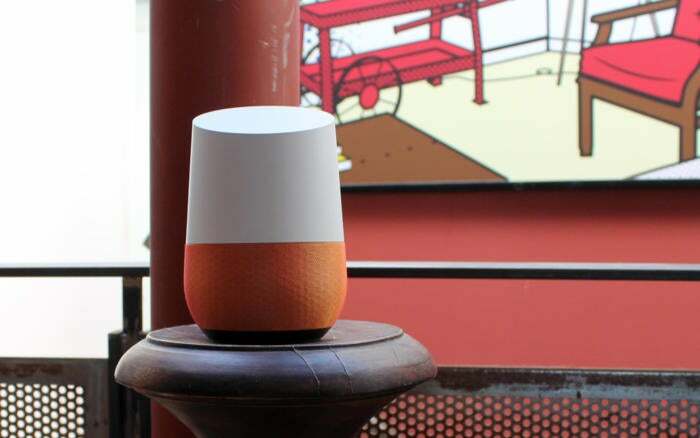 Google Home can remain rather anonymous around strangers—until it starts talking back. Set-ups like this underscore Google’s shortcomings in home control. But they also illustrate a bright future ahead. And, to be sure, I saw glimmers of smart-home excellence during Google Home testing. As I’ve already shared, Nest thermostat control is excellent. But what I discovered with Chromecast support was downright amazing. I was watching the Warriors game over my cable box on a Samsung TV. I voiced, “OK Google, play YouTube on Chromecast,” and the TV magically switched the input source from my Xfinity DVR to the Chromecast, and kicked into my YouTube account. I almost did a double-take. Now, I definitely expected reliable voice control once inside Chromecast’s YouTube app, but input switching? My Google contact explained that Chromecast and Samsung both support CEC switching, but I had never experienced this technology trick until Google brought it home. There’s still work ahead for the Google Home team. Google needs to support all the smart home platforms that the Echo supports, and Google Home could still learn a few tricks for the devices it does control. For example, Home can instantly switch from my cable box to Chromecast, but it’s incapable of switching back. Google Assistant could also stand to get even smarter. It still can’t send text messages or emails, it can’t recognize more than a single Google account, and it can’t differentiate different users according to their voice patterns. Still, these are still early days for Google Home, and its fit, finish, and user experience is great for a version one effort. Now it’s just incumbent upon Google to maintain forward momentum, and not treat Home as just another hardware experiment. Amazon has already iterated on the Echo twice since it was first released to a broad audience in June 2015. And now with Home making such a grand entrance, we have to expect Amazon price drops, and a spectacular Echo reboot sometime soon. Well, at least a hardware reboot. There’s no way in hell that Google will ever license out Google Assistant. This story, "Google Home review: Google puts its A.I. on a nightstand for the win" was originally published by TechHive.